I was lucky to get hold of tickets for this gig. With Sonisphere cancelled, I suppose Faith No More needed their annual fix of nostalgia and renewed music royalties. Like most gigs by reformed veterans from yesteryear, there was a manic feeding frenzy and it sold out in moments. Luckily, I happened to be online at the exact moment the gig was announced. Faith No More are unlikely candidates for their classic-rock status. Often, they were at odds with the mainstream and deliberately contrary. Whether they were screaming lyrics about eating poo or playing Bee Gees covers at Slayer fans, you’d be forgiven for thinking Faith No More were trying to sabotage their own career. 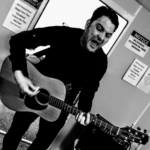 They came across as subversive imposters in the pop charts and created a niche in the industry on their own terms – In the process they recorded soaring rock anthems and influenced new genres of music – But more importantly they were a lot of fun and it’s nice to have them back. Martina Topley Bird is the support act for the night, and jolly good she is too. Martina has worked with some big names including Tricky and Massive Attack. Backed by a multi-instrumentalist ninja in full ninja costume, she performs eclectic vocal workouts whilst pottering about with keyboards, glockenspiels, drums, guitars and loop recorders. There are some pleasing results and the duo come across as an art-rock version of the Ting Tings. Unfortunately Faith No More have attracted a small contingent of pesky hecklers in heavy metal t-shirts, but Martina soldiers on and a good section of the crowd warm to her. There is a long change over between bands. 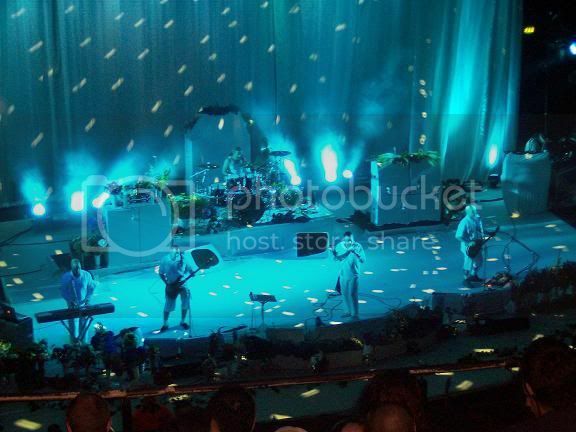 The floor of the stage is draped in a white covering, as are the amps – Even the roadies are dressed in matching white garments. Flowers are being placed all over the stage and it’s starting to resemble an expensive wedding reception. 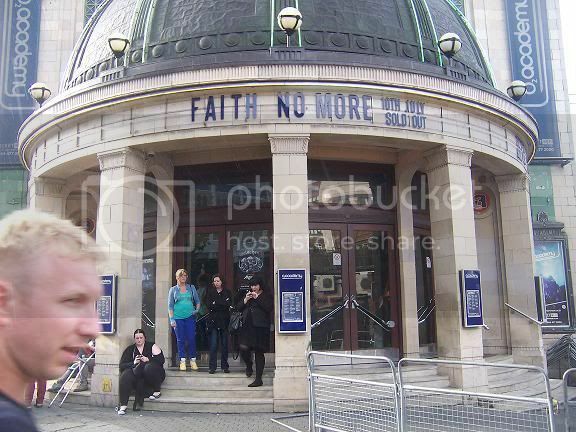 Back in the day, Faith No More recorded a live album at Brixton Academy and they appear to be taking this gig quite seriously. For me too, this evening is quite important – The first band I ever saw live were Faith No More and there is a lot of déjà vu – I am even seated in the balcony again. Sadly the price of alcohol has changed a lot since the eighties – I head to the bar and realize a can of Tuborg lager cost £4.55 – Less than a pint of weak beer for nearly a fiver. Shame on you Brixton Academy. Finally, the house lights go down and there’s a massive cheer as keyboardist Roddy Bottum appears in the spotlight. Faith No More open with folk/thrash instrumental Woodpecker From Mars and when Jon Hudson’s guitar explodes out of the PA it’s great stuff. Halfway through the song, virtuosic front-man Mike Patton marches out dressed as the man from Del Monte and leads the band into a cover of Tom Jones’ Delila – Two minutes into the set and the mischievous pranks are already underway, but everyone knows to expect the unexpected. The crowd lap it up and it feels like everyone is singing along. From here, Faith No More rely heavily on melody and anthemic punch. A lot of the darker songs are absent – For example, there is no Cuckoo For Caca, Jizzlobber or Malpractice. What we do get are some welcome strolls down memory lane, including a rare performance of Spirit from the Chuck Mosley era. Needless to say there are some great moments – Ashes to Ashes sounds gigantic and it’s suitably uplifting when five thousand-odd people chant ‘Smiling with the mouth of the ocean’. 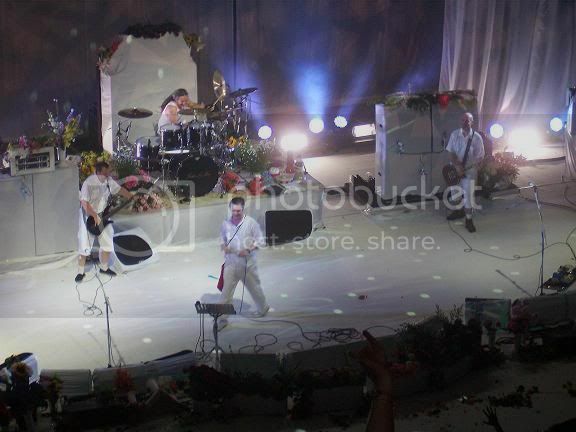 To appease the metal fans, Faith No More hammer out splendidly obnoxious performances of Surprise! You’re Dead! and The Gentle Art of Making Enemies. As always, there are obvious crowd pleasers – Midlife Crisis, Everything’s Ruined, Epic and Caffeine are all present and correct. We are also treated to some Serbian folk music – Which is nice. Mike Patton is renowned for on-stage tomfoolery and tonight is no exception. When a dangerous looking member of security refuses to sing the chorus to Lionel Richie’s Easy, Patton returns later and taps his microphone on the back of the bouncer’s bald head to make it go BOK! BOK! through the PA . It’s fun to watch. The O2 security guards have been over-zealous tonight. We are treated to two encores and the gig ends with the double salvo of Stripsearch and a storming version of 1985 rap-metal classic We Care A Lot (the thinking person’s answer to Do They Know It’s Christmas?). As Billy Gould slams his bass into the floor with a resounding WHUMP! you know it’s all over – Job done – Everyone’s had a great time. We head out into the friendly streets of Brixton and avoid the dimly lit shortcuts – but it’s been worth it.